Independence Hall is a United States national landmark located in Philadelphia, Pennsylvania. The building was completed in 1753 as the Pennsylvania State House for then Province of Pennsylvania. In 1775, it became the principal meeting place of the Second Continental Congress until 1783. It is known primarily as the location of the signing of the United States Declaration of Independence. It was here that the declaration was debated, adopted, and signed in 1776. Also after considerable debate the The Constitution of the United States was adopted and signed here in 1787. The building is now part of the larger Independence National Historical Park which also includes the Liberty Bell, the Independence Visitor Center, and the National Constitution Center, along with many other historic buildings and educational centers. In 1979, Independence Hall was designated a UNESCO World Heritage Site. The UNESCO proclamation recognizes the building's "fundamental importance to American history and profound impact on law-makers around the world" of the historic foundational documents signed here during the formation of the United States of America. Exterior view of Independence Hall (c. 1770s). Independence Hall is a red brick building, built between 1732 and 1753, designed in the Georgian style by Edmund Woolley, an English-born architect and Andrew Hamilton, a Scottish-born lawyer who also served as the attorney general of Pennsylvania from 1729 to 1739. It was built by Woolley, who was also a master carpenter. Its highest point is 41 meters above the ground. Its construction was commissioned by the Pennsylvania colonial legislature and it was initially inhabited by the colonial government of Pennsylvania as their State House. Two smaller buildings adjoin Independence Hall: Old City Hall to the east, and Congress Hall to the west. These three buildings are together on a city block known as Independence Square, along with Philosophical Hall, the original home of the American Philosophical Society. To the North is Independence Mall and the current home of the Liberty Bell. 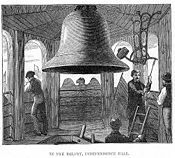 Centennial Bell in the Independence Hall Belfry, 1876 engraving. The bell tower steeple of Independence Hall was the original home of the Liberty Bell, a bell that has served as one of the most prominent symbols of the American Revolutionary War. It is considered a familiar symbol of independence within the United States and has been described as an icon of liberty and justice. Today the bell tower holds a "Centennial Bell" that was created for the U.S. Centennial Exposition in 1876. The original Liberty Bell, with its distinctive crack, is now on display across the street in the Liberty Bell Center. In 1976, Queen Elizabeth II of Great Britain visited Philadelphia and presented a gift to the American people of a replica Bicentennial Bell, which was cast in the same British foundry as the original. This 1976 bell hangs in the modern bell tower located on 3rd Street near Independence Hall. 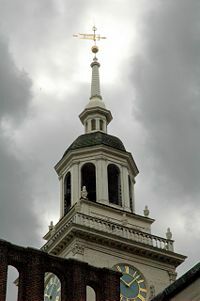 The bell tower atop Independence Hall, formerly home to the Liberty Bell. From 1775 to 1783, Independence Hall served as the principal meeting place of the Second Continental Congress, a body of representatives from each of the thirteen British North American colonies. The Declaration of Independence was approved there on July 4, 1776, and the Declaration was read aloud to the public in the area now known as Independence Square. This document unified the colonies in North America who declared themselves independent of the Kingdom of Great Britain and explained their justifications for doing so. These historic events are celebrated annually with a national holiday for U.S. Independence Day. On June 14, 1775, delegates of the Continental Congress nominated George Washington as commander of the Continental Army in the Assembly Room of Independence Hall. The Congress appointed Benjamin Franklin to be the first Postmaster General of what would later become the United States Post Office Department on July 26. In September 1777, the British Army arrived to occupy Philadelphia, forcing the Continental Congress to abandon the State House and flee to York, Pennsylvania, where the Articles of Confederation were approved in November 1777. The Congress returned on July 2, 1778, after the end of the British occupation. However, as a result of the Pennsylvania Mutiny of 1783, Congress again moved from Philadelphia in June 1783. A Map of Philadelphia and Parts Adjacent, depicting the State House as it appeared in 1752. In September 1786, commissioners from five states met in the Annapolis Convention to discuss adjustments to the Articles of Confederation intended to improve commerce. They invited state representatives to convene in Philadelphia to discuss improvements to the federal government. After debate, the Congress of the Confederation endorsed the plan to revise the Articles of Confederation on February 21, 1787. Twelve states, Rhode Island being the exception, accepted this invitation and sent delegates to convene in June 1787 at Independence Hall. The resolution calling the Convention specified its purpose as proposing amendments to the Articles, but the Convention decided to propose a rewritten Constitution. The Philadelphia Convention voted to keep deliberations secret, and to keep the Hall's windows shut throughout the hot summer. The result was the drafting of a new fundamental government design, which eventually stipulated that only 9 of the 13 states would have to ratify for the new government to go into effect (for the participating states). Congress, noting dissatisfaction with the Articles of Confederation government, unanimously agreed to submit the proposal to the states despite what some perceived as the exceeded terms of reference. On September 17, 1787, the Constitution was completed, and took effect on March 4, 1789, when the new Congress met for the first time in New York's Federal Hall. Article One, Section Eight, of the United States Constitution granted Congress the authority to create of a federal district to serve as the national capital. Following the ratification of the Constitution, the Congress, while meeting in New York, passed the Residence Act of 1790, which established the District of Columbia as the new federal capital. 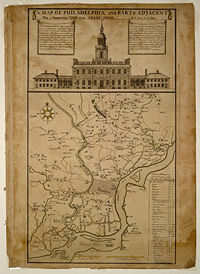 However, a representative from Pennsylvania, Robert Morris, did manage to convince Congress to return to Philadelphia while the new permanent capital was being built. As a result, the Residence Act also declared Philadelphia to be the temporary capital for a period of ten years. 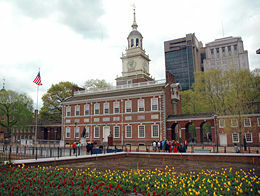 The Congress moved back into Philadelphia on December 6, 1790, and met at Congress Hall, adjacent to Independence Hall. Thomas Masaryk, who declared Czechoslovakia's independence from Austria-Hungary on the steps of Independence Hall in 1918. Thomas Masaryk was an Austro-Hungarian and Czechoslovak statesman, sociologist and philosopher, and a strong advocate of Czechoslovak independence during World War I. In 1918, as head of the Mid-European Union, he traveled to the United States where he convinced President Woodrow Wilson of the rightness of his cause. On October 26, 1918, Masaryk called for the independence of the Czecho-slovaks and other oppressed peoples of Central Europe on the steps of Independence Hall. 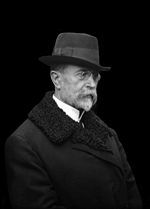 With the fall of the Austro-Hungarian Empire, the Allies recognized Masaryk as head of the Provisional Czechoslovak government, and in 1920 he was elected the first President of Czechoslovakia. In 1948, the building's interior was restored to its original appearance. Independence National Historical Park was established by the 80th U.S. Congress later that year to preserve historical sites associated with the American Revolution. It comprises a landscaped area of four city blocks, as well as outlying sites that include: Independence Square, Carpenters' Hall (meeting place of the First Continental Congress), the site of Benjamin Franklin's home, the reconstructed Graff House (where Thomas Jefferson wrote the Declaration of Independence), City Tavern (center of Revolutionary War activities), restored period residences, and several early banks. The park also holds the Liberty Bell, Franklin's desk, a portrait gallery, gardens, and libraries. A product of extensive documentary research and archaeology by the federal government, the restoration of Independence Hall and other buildings in the park set standards for other historic preservation and stimulated rejuvenation of old Philadelphia. The site, administered by the National Park Service, is listed as a World Heritage Site by UNESCO (joining only three other U.S. man-made monuments still in use, the others being the Statue of Liberty, Taos Pueblo, and the combined site of the University of Virginia and Monticello). On Independence Day, July 4, 1962, President John F. Kennedy addressed the 54th National Governors' Conference in Independence Square. While Kennedy recognized and honored the historic occurrences relating to America's independence from Britain, he took the opportunity to declare support for all nations seeking liberty, as well as promoted the concept of interdependence. 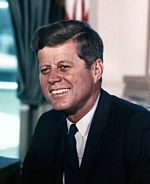 President John F. Kennedy gave an Independence Day speech to the 54th National Governors' Conference in Independence Square. The theory of independence is as old as man himself, and it was not invented in this hall. But it was in this hall that the theory became a practice; that the word went out to all, in Thomas Jefferson's phrase, that "the God who gave us life, gave us liberty at the same time." And today this Nation—conceived in revolution, nurtured in liberty, maturing in independence—has no intention of abdicating its leadership in that worldwide movement for independence to any nation or society committed to systematic human oppression… But I will say here and now, on this Day of Independence, that the United States will be ready for a Declaration of Interdependence, that we will be prepared to discuss with a united Europe the ways and means of forming a concrete Atlantic partnership, a mutually beneficial partnership between the new union now emerging in Europe and the old American Union founded here 175 years ago… Acting on our own, by ourselves, we cannot establish justice throughout the world; we cannot insure its domestic tranquility, or provide for its common defense, or promote its general welfare, or secure the blessings of liberty to ourselves and our posterity. But joined with other free nations, we can do all this and more. We can assist the developing nations to throw off the yoke of poverty. We can balance our worldwide trade and payments at the highest possible level of growth. We can mount a deterrent powerful enough to deter any aggression. And ultimately we can help to achieve a world of law and free choice, banishing the world of war and coercion. Independence Hall's Assembly Room, in which both the Declaration of Independence and Constitution were drafted and signed. Following the September 11, 2001 attacks in which hijackers intentionally crashed two airliners into the Twin Towers of the World Trade Center in New York City, another into The Pentagon, and a fourth into a field near Shanksville, Pennsylvania (believed to have been headed toward Washington, D.C., security around Independence Hall was strengthened. This was part of a national effort to safeguard historical monuments by the United States Department of Homeland Security. Pedestrian traffic around Independence Square and part of Independence Mall was restricted by temporary bicycle barriers and park rangers. In 2006, the National Park Service proposed installing a seven-foot security fence around Independence Hall and bisecting Independence Square, a plan that met with opposition from Philadelphia city officials, Pennsylvania Governor Ed Rendell, and Senator Arlen Specter. In response, the National Park Service agreed to the elimination of the fence in favor of movable bollards and chains, and also to remove at least some of the temporary barriers to pedestrians and visitors. Independence Hall is pictured on the back of the U.S. $100 bill, as well as the bicentennial Kennedy half dollar. The Assembly Room is pictured on the reverse of the U.S. two dollar bill, from the original painting by John Trumbull entitled Declaration of Independence. ↑ John F. Kennedy, July 4, 1962, Address at Independence Hall, John F. Kennedy Presidential Library and Museum. Retrieved December 13, 2008. ↑ Ian Urbina, August 9, 2006, City Takes On U.S. in the Battle of Independence Square, The New York Times. Retrieved December 13, 2008. Dallek, Robert, and Terry Golway. 2006. Let Every Nation Know: John F. Kennedy in his own Words. Naperville, IL: Sourcebooks MediaFusion. ISBN 9781402209222. Eberlein, Harold Donaldson, and Cortlandt Van Dyke Hubbard. 1948. Diary of Independence Hall. Philadelphia: J.B. Lippincott Co.
Mires, Charlene. 2002. Independence Hall in American Memory. Philadelphia: University of Pennsylvania Press. ISBN 9780812236651. National Park Service. Independence National Historical Park. Retrieved December 12, 2008. National Park Service. Independence Hall: International Symbol of Freedom. Retrieved December 12, 2008. History of "Independence Hall (United States)"
This page was last modified on 28 February 2018, at 19:44.